Millie #5156 - Yankee Golden Retriever Rescue, Inc.
Millie was 1 ½ years old when she came to Rescue. Millie was not the bravest of Goldens, and her personality was just not the right fit for her family’s lifestyle. They wanted Millie to have a quieter home where she would be happier. Since we take great care to match each dog to the right new home, Millie’s family entrusted her to us. Millie was positive for Lyme disease, so we placed her on a treatment regimen which she completed with no problems. She was otherwise a healthy girl and she was soon settling in at Riverview. She was on the shy side when she came in, but she was always very sweet and well-behaved. It didn’t take long to win her over, especially with the help of a tennis ball! She loved to bound after the ball in one of the large play yards! When Millie was inside, she enjoyed attention and being near people at all times. Millie also liked to go for walks in the woods. She was very well-behaved on the leash and it was a pleasure to spend time with her. Millie needed a quiet home where she would be the center of attention. Luckily for her, repeat adopters were looking to once again open their hearts and home to a Rescue dog. Millie now is in the perfect environment for her. Her adopters are very patient and loving. As a result, Millie is gaining more confidence every day. Millie is still a perfect lady on her walks. She loves the snow, and her adopters love to throw tennis balls for her in the yard, as well. They even took the snow blower and made paths for her around the yard – anything to make Millie happy! Millie’s adopters say that they are grateful to be able to give Millie a safe and happy home. As you can see, Millie is equally happy to have such a loving family! Millie thanks you for your support. 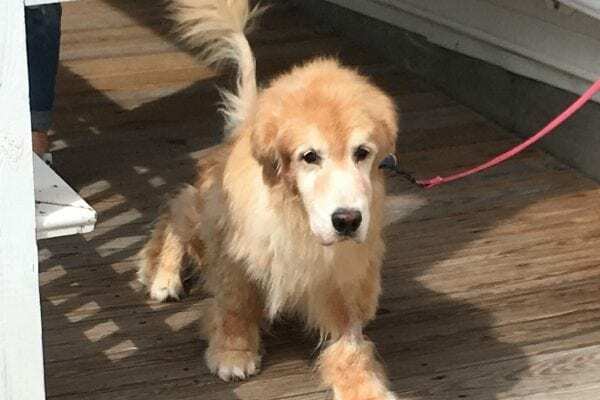 Millie needed a home that was able to give her the attention and exercise that young Goldens require while understanding that she not as outgoing as many Goldens. We match each dog to the right adoptive home based on their personality and needs. This special care is made possible thanks to the generosity of all of our supporters. Millie and all the Rescue dogs thank you and send big wags and kisses your way!